I’ve had plenty of Personal Trainers and Fitness Coaches in my time, stemming from as far back as Primary School. My Primary School Phys. Ed. teacher was called Mr Clarke and his intolerance for 10 year old shenanigans was what started me on a reasonably successful running pastime that lasted until just after I finished high school 8 years later. An active AFL boundary umpire, who ran till his nose bleeds was my High School running coach and he made sure we got the most out of ourselves. No running session was ever easy. I still have nightmares relating to sand dunes…. and same to goes for my current trainer and general overseer of fitness challenges at Dadbod2Boxer – Dave Trotter. A man who ensures that he get’s the most out of their clients. Without YELLING. Dadbod2Boxer: So Dave, who are you? Tell us a bit about your background and your personal training approach? Dave Trotter: I have always been active with a lot of different sports played under my belt. I have been boxing since I was 15 but didn’t take it seriously until I finish my service in the Australian Army. I started fighting in amateur Boxing, then moved into Muay Thai and finally into MMA. 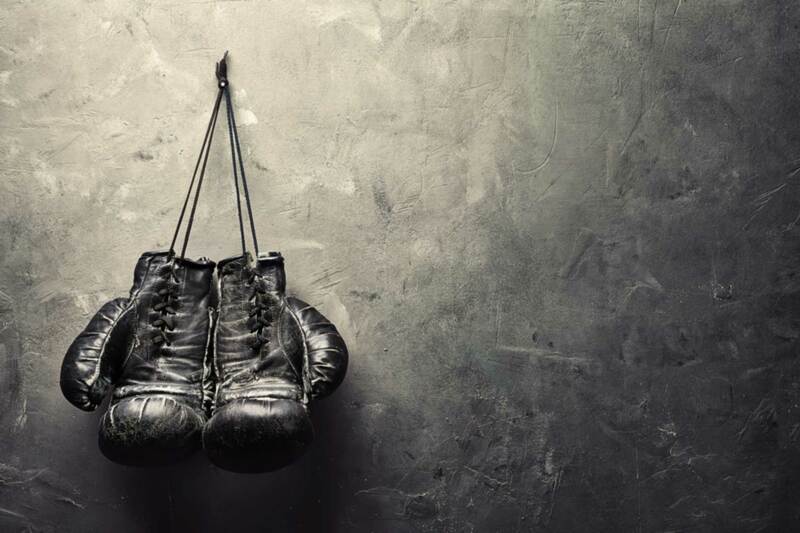 I have always felt that boxing has been my strong suit so decided to focus on that which landed me a couple more boxing fights and the job I’m in today. My training style is to cater for what the client is after. Clients who want to fight, I will teach them. Clients who want to learn but want to get fit I will teach as well and push them to achieve 100% effort out of the session. I also train clients for strength and conditioning where I will also focus on teaching them correct form but push them too their limits. I am a firm trainer and don’t believe I have to yell to achieve that. Dadbod2Boxer: You’ve overseen the entire Dadbod2Boxer program, what sort of condition was Brandon in, in terms of fitness and skills before he started? You can be as brutally honest as you like! Dave Trotter: Brandon wasn’t in great shape both in body and fitness or skill. He definitely had weight to lose and his fitness levels were definitely below average. I didn’t expect his skill levels with boxing to be anything special as I wouldn’t expect from anyone else who has just starting out at boxing. It’s a very hard sport to become good at and takes along time to reach it. Dadbod2Boxer: How have you tried to structure Brandon’s training program? 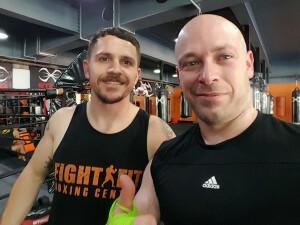 Dave Trotter: Brandon’s program to start with was focused on fitness and conditioning and the boxing skills he needed for the FightFit Training Camp that he signed up to. Now we are expanding his skills in boxing with more advanced movements and footwork etc. We are also working on some kickboxing skills and advanced strength and conditioning. 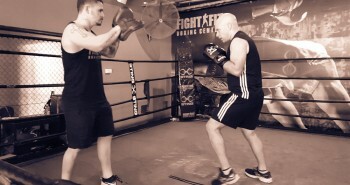 Dadbod2Boxer: Did you think he was going to be able to achieve getting through your own program as well the FightFit Training Camp? Don’t tell us you went easy on him! Dave Trotter: My program for him was surrounded around what he needed for the FightFit Training Camp. I thought he had a good chance of passing the training camp as he was very focused on his training and diet requirements to lose the weight. I definitely wasn’t easy on him and I’m confident that we/him did everything we could to get Brandon ready to pass the training camp. Unfortunately he didn’t quite get there but that wasn’t his failure as the training camps requirements were set very high and as I said I think he did what he could and left nothing behind leading into it and on the day of testing. 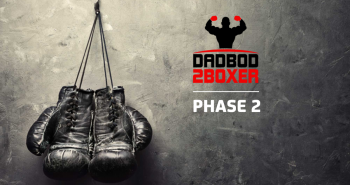 Dadbod2Boxer: So now that the first phase of Dadbod2Boxer is done and dusted, how do you feel Brandon went with the rigours of your training schedule and how much progress has he made compared to your very first session? Dave Trotter: Brandon is a new person, he has lost a lot of weight, he seems happier and is always very keen to train. His boxing skills have come along way and he is now looking at taking part in one of our fight challenges next year which is definitely not for everyone. 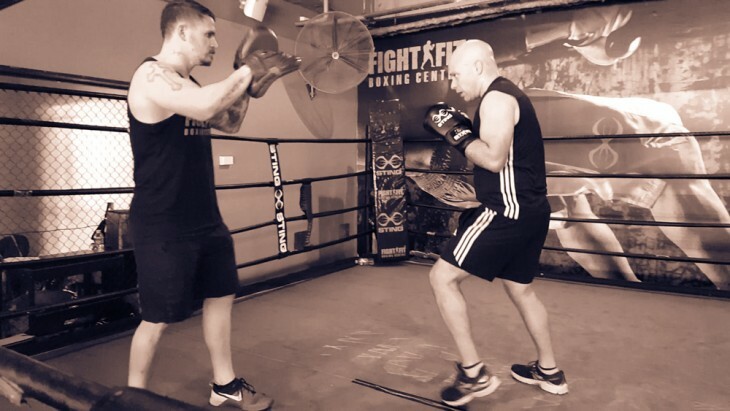 As I said earlier, we are doing some advanced boxing work as well as advanced strength and conditioning and kickboxing, so he has come along way in the space of time he has been training with me. His fitness levels are high now and can only keep getting higher. Dadbod2Boxer: Overall, what’s it been like training Brandon? Does he get grumpy when you give him too many burpees? Dave Trotter: Brandon is a pleasure to train, I love to train clients who don’t complain, want to train hard and want to learn. Brandon is great at all of these so training him is easy and enjoyable. Dadbod2Boxer: So the training is still continuing, right? So then where to from here? Where is it you would like Brandon to be in the next 3-6 months? Dave Trotter: Training is still going strong and as I said earlier, he is learning more and more skills from our sessions and is looking to take part in our next fight challenge next year so that is the next big focus for his training sessions with me. Dadbod2Boxer: Well, thanks Dave. I best get out of here before you throw more burpees at me to do! So there you have it. Seriously though, Dave has been and continues to a great trainer. There’s so much more for me to learn, which always makes me eager to head in to the gym and get as many sessions underneath my belt as possible. One of the key’s to consistent training is to find something you love and do it. Don’t over think it and feel you have to “mix it up” a bit if you don’t want to. If you are happy just to run, then just run! Expanding your training horizons will come with time. Till next time, Box On! Previous postDadbod2Boxer – The Results! Next post2017 Kick Off Starts – Cleanse what?